Pashupatinath, dedicated to Lord Shiva, is for Shiva devotees one of Asia's four most important religious sites. The site was built in the 5th century and was later restored by the kings of Malla and was discovered by a Shiva lingam since the beginning of the millennium. It extends to both sides of the river Bagmati, which is considered holy by Hindus, the largest temple complex in Nepal. In the pagoda style, the main temple has a gold roof and four sides are covered in the finest quality silver and wood gravings. The Pashupatinath Temple is surrounded by temples dedicated to various other Hindu and Buddhist deities. One of 8 UNESCO Cultural Heritage Sites in the Katmandu Valley, Pashupatinath Temple. The last Hindus rites are also carried out at the cremation site. The site of the cremation and the events are not for the weaker; the visitors are still curious about the hill across the river. For an out-of-world experience, visit Pashupatinath Temple. Experience a combination of religious, cultural and spiritual experiences on this highly recommended religious hub. The shrine area also includes Deupatan, Jaya Bageshori, Gaurighat (Holy Bath), Kutumbahal, Gaushala, Pingalasthan and Sleshmantak Forest 3 km northwest of Kathmandu on the banks of the river.There are about 492 temples to explore, 15 Shivalayas( Lord Shiva Shrines) and 12 Jyotirlingas( Phallic Shrines). Boudhanath is one of the most impressive landmarks in Kathmandu, 8 km east of downtown Kathmandu, visible as soon as you reach Tribhuvan International Airport. It's Kathmandu valley's biggest stupa. Boudhanath stupa, 36 meters high, is one of the biggest stupas in South Asia. Boudhanath is the centre of Tibetan Buddhism in Nepal with the countless monasteries around it. The location of the stupa is interesting because it used to be on the ancient trade route to Tibet, where Tibetan merchants stayed for centuries and prayed. There is a pair of all-seeing eyes of Buddha on either side, symbolizing awareness. The canopy is 13 steps away. On the ground floor, there is a brick wall with 147 niches and 108 images of the Buddha meditation inset behind copper prayer wheel. Swayambhunath, also known as the "Monkey Temple "among foreign visitors, sits on top of its hill overlooking most parts of the valley. It's a great place to enjoy panoramic city views. Swayambhunath is one of the most holy Buddhist Chaityas in Nepal, on a hill 3 km west of Kathmandu. It is said that the valley developed spontaneously more than 2,000 years ago. The largest picture of the Sakyamuni Buddha in Nepal is on the western border of Swayambhu on a pedestal. Behind the hill there is a temple dedicated to the goddess of learning, Manjusri or Saraswati. The Stupa complex is filled with chaityas, Buddhist and Hindu deities ' statues and shrines. The base of the hill is almost entirely surrounded by recently installed prayer wheels. The stupa is situated on the top of the hill, and the extremely steep steps leading to the sanctuary are very difficult. However, there is also a road near the top, and you can drive up. Many Buddhists and Hindus have been visiting Swayambhunath all day long. 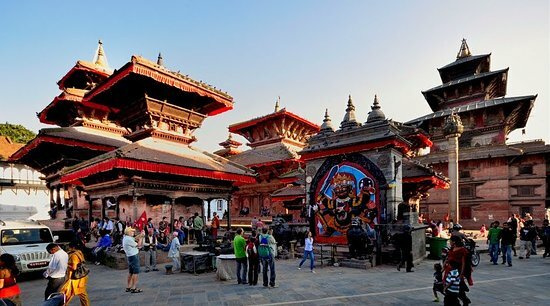 One of the main attractions in Kathmandu Valley is Kathmandu Durbar Square (' UNESCO World Heritage Site'), also known as Hanuman Dhoka Square. Most of Nepal's cultural centers are concentrated around the Kathmandu Valley; Hanuman-dhoka Durbar Square is one of those cultural sites. The name Hanuman-dhoka Durbar comes from the Hanuman statue created by King Pratap Malla at the entrance to the Royal Palace in 1672 A.D. King Prithvi Narayan shah built a storeyed residence in 1770, called Basantapur Durbar(palace). The entire complex is also called Durbar Square in Kathmandu. The main things that can be seen here are: "Kumari "Gar "Kastha Mandap "Maru Ganesh, Temple of the Mahadev, Shiva Parvati Temple, Temple of the Old Bhagvati, the Temple of Sarasvoti and the Octangular Temple of Krsna, Big Drums, Kal Bhairav, Temple of the Jagannath, Talai Temple, etc. Patan, the oldest of the three cities in the Valley of Kathmandu. They are best known for their artistic heritage. It is probably one of the world's most ancient Buddhist cities. The town is situated across the Bagmati River on a plateau. Lalitpur is another Patan name. The town is encircled by 4Stupas, four corners of Patan, one in each corner of its cardinal points. These stupas were supposed to be built by the famous Ashoka Emperor. This is one of the finest architectural treasures of which Patan is extremely proud. About the beauty of Patan, a western lady writer has to say this-" Patan means eternity itself, and Patan Durbar Square is indeed the spectacular sight of Asia. The square is packed with antique places, temples and shrines famous for the exquisite sculptures. 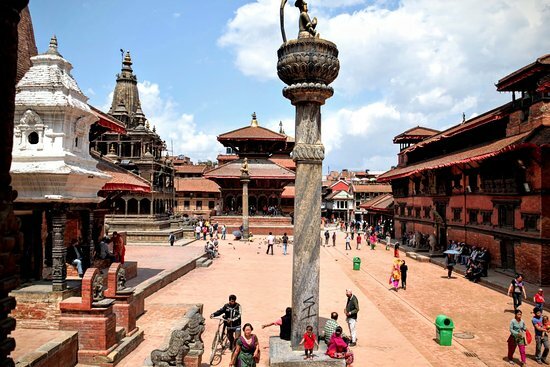 The former Royal Palace complex houses a museum containing bronze statues and religious objects and the center of the religious and social life of Patan. On the square are three principal courtyards, named central Mul Chowk, Keshav Narayan Chowk and Sundari Chowk. Located in Kwabadehul, this three-story golden Lokeshwar pagoda (Lord Buddha) was built by King Bhaskar Verma in the 12th century. It is famous as the Temple of Gold. The upper floor of the pagoda contains golden images of Lord Buddha and a great wheel of prayer. Built in the 17th century, Lord Krishna 's temple occupies a commanding position in the Patan palace complex. It is the only temple in Nepal that has 21 sanctuaries and is made of stone. Most important scenes of the ancient Hindu epics, the Ramayana and the Mahabharata, were graved on their friezes. This has been constructed especially for King Siddhi Narasingha Malla. His devotion to Lord Krishna and Karunamaya Lokeshwar, the Buddhist god of compassion, is a famous episode in Nepalese religious history. The Temple of Changu Narayan Hilltop is Vishnu the oldest shrine in the Valley of Kathmandu, 4 km north of Bhaktapur. 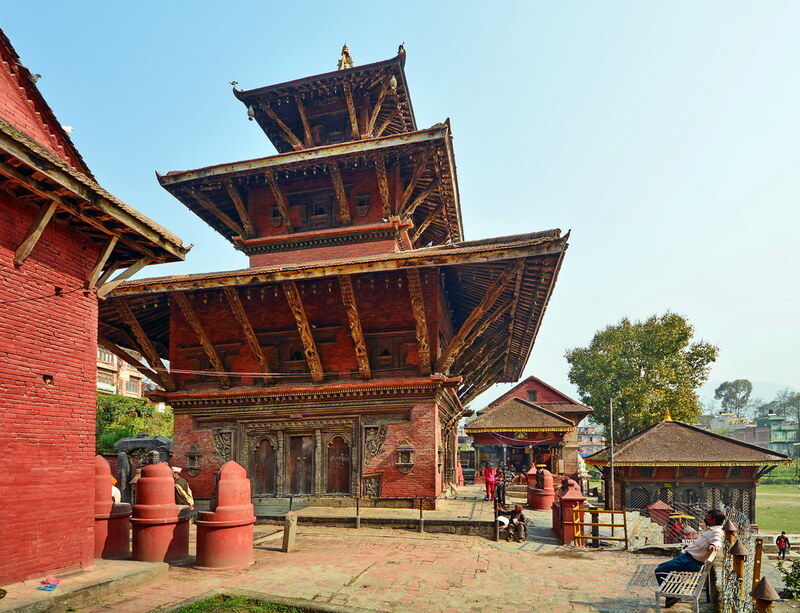 Established in 325 AD, it is one of Nepal's best-known and most important historical structures. In 1702, after its destruction by fire, the two-story temple was reconstructed with a large number of complex carvings made by ten Vishnu incarnations and various tantric multiarmed goddesses. However, the true gems of Changu Narayan are the Lichhavai stone, wood and metals gravings in the courtyard surrounding the main temple (fourth-9th centuries). The mystical Buddhanilkantha Temple, meaning "old blue-throat, "is located at the northern end of the Shivapuri Hill in the Kathmandu Valley, only 9 km from the city. It is here that you will find one of the three images of the deity Lord Vishnu or the full Vishnu (Narayan) Jalasayana, which is considered the main deity by the local people. King Pratap Malla created a deep faith through a prophetic dream with the sacredness of this particular God. It was his strong belief and fear that death would be imminent upon his departure if the King of Nepal visited the Buddhanilkantha Temple. The two other pictures of the deity, which were simultaneously carved, are located in two particular places: the Balaju Gardens, which are open to the public, and the magnificent Kathmandu Royal Palace. But public viewing is not allowed here in Budhanilkantha Temple. Lord Vishnu's Deity is prominently located within a tank, which is 13 meters in length, and which looks as if it is floating. The Deity is thought to have been around 1500 years old and to have been sculpted around the 7th or 8th centuries during the Licchavi period. Hindus is a frequent practice to go down to the feet of Vishnu to reach them, but foreign visitors are forbidden to do the same. 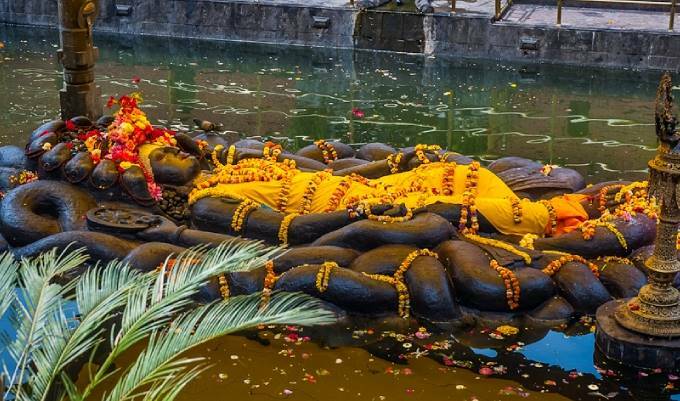 Budhanilkantha has become the place for Haribondhini Ekadashi at the end of October or the beginning of November. It is the main festival of the year that Lord Vishnu is celebrated for thousands of people by the awakening from his long sleep. Today, Budhanilkantha 's formidable temple, interesting enough, has even an unthinking guesthouse. On the day, Kaag or crow is fed. The crow is regarded as the messenger. The Kaag brass idol (a bird type) weighing 227 kg is the main attraction of the temple. Under the Hindu and Buddhist religions, a Brahmin batuk from Kantibhairav Gurukul in Gokaneshwor and a Buddhist monk from the Gagalphedi monastery performed puja separately in the image of Kaag. 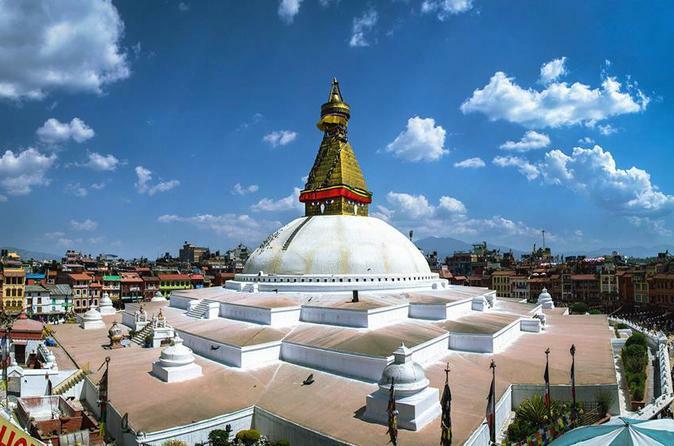 The temple was built at the cost of Rs 1.3 million from the electoral development program and the municipality of Kageshwori Manohara provided by lawmaker Rameshwor Phuyal. The Government of Province 3 has allocated Rs 380 million to the construction of the Park Road Brahmakhel-Satghatte-Gagalphedi-Sahid. One of the most popular Tibetan Buddhist monasteries is the Kapan Monastery which is situated on a hill not far north of Budanath. Every year there are many foreigners studying Buddhism and meditation. The monastery of Kapan was founded by Lama Thubten Yeshe who died in 1984. Interestingly, a young Spanish boy named Osel Torres became his successor after he was declared a reincarnation of the great Lama. Reincarnation, however, no longer resides in Kapan. The spiritual program in Kapan offers introductory courses in the series Discover Buddhism, which deals with the fundamental principles of Tibetan Buddhism and meditation. The Next Step series leads to a deeper understanding of these principles. Courses include Mind, Karma, Death and Death, Bodhicitta and much more. There are five-day and ten-day courses and one-month meditation. There are also short courses in Tibetan Medicine, Thangka painting and the popular 10-day Buddhist psychology and philosophy residential courses. Courses vary in length and some students spend months in their studies at the monastery. Kapan Monastery was once open to visitors all week, but the entrance was restricted with too many visitors arriving. There is a library and a large garden with sunlight in the evening. A good restaurant with a wonderful view of Kathmandu is open to everyone and serves good food. In special pujas, large crowds of devotees go up to the monastery for blessings and homage. You can also walk along the ridge and visit the Phulhari Monastery on a hill higher than Kapan after reaching the Kapan Monastery.